In an interview with DW the head of the UN peacekeeping mission in the Democratic Republic of Congo (MONUSCO), Leila Zerrougui, acknowledged that there are still huge challenges ahead in the country, including the professionalization of the army and border control. But she feels confident that the situation in the DRC is improving. DW: In 2019, MONUSCO will have been in the DRC for 20 years. What has really changed in that time, especially in terms of security and above all for the populations in the east of the country? Leila Zerrougui: A lot of things. First, while we are in a country that still has armed groups in at least six of the 26 provinces, there are no territories left where the government troops cannot penetrate. There are still enormous challenges with regard to the professionalization of the army, with regard to the professionalization of the police, the sovereign functioning of the state and border control. But there is progress, thanks also to all the work and efforts of the international community. I think this year we will do an evaluation with the competent authorities to ascertain what we have already achieved and how we will move forward together. If you tell the people of Beni, for example, that the situation has improved a lot, they will probably laugh. Or cry, because the ADF militia (Alliance of Democratic Forces) still attacks the population on a regular basis. What are they telling you? How do they react? Almost 70% of our troops have been deployed in the Beni region. We have the FIB (rapid reaction force) and special forces there. We have a lot of people there, because it is an area that needs our protection. There is progress. We are after all talking about a territory of 2.5 million square kilometers (1.5 million square miles). DW: The rapid reaction force FIB was created in 2013 and had a spectacular success in 2013 with its victory over the M23 militia. We haven't heard much from it since then. And yet we've had the highest number of soldiers killed in the area of Beni in 2017. It was hard for me meeting with their families in in Tanzania, in Malawi. me. Peacekeepers are forced to wage war there, when they are supposed to bring peace. It's much more complicated than we think. You mentioned the progress made by the country, but you also named territories where there is ongoing. There's Kasai, Tanganyika, Ituri. Wouldn't you say these conditions do not speak for a withdrawal of MONUSCO? Many armed groups are surrendering. Now the challenge will be integrating them. We can see this phenomenon in Ituri with the FRPI (Forces de Resistance Patriotique de l'Ituri) and also in Tanganyika. There is hope. But it's not going to be done in two months. So the mission won't leave right away? In view of the work still to be done, like the training of the Congolese army you've mentioned, will the mission stay on for a while? 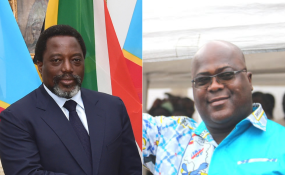 The President of the Republic [Felix Tshisekedi, editor's note] asked for some time to identify priorities and start the drop-down and departure of MONUSCO. No one, neither the former president [Joseph Kabila] nor the current one is asking for MONUSCO to stay forever. And I do not believe that those who decide on our mandate have that intention. The ADF are a difficult enemy, a militia that is difficult to fight. Is a dialogue with the ADF even possible since it is not a unified structure, but rather a dispersed militia? It is not a militia - it is an armed group that settled in the DRC in the 1980s. Mobutu [Former President of Zaire - now DRC - Mobutu Sese Seko] gave them this territory. So they consider it to be their own. Of course, because there are marriages and there is also the economy. They sell gold and wood to neighboring countries. There is an economic dimension and there is a social dimension. We should obviously be careful not to end up with an armed group that could grow an international rather than regional dimension, affecting Uganda and Congo. I do not believe that problems are solved by force alone. Of course, we're not going to stand them up against a wall and shoot them. They have children, they have women. Are we going to kill them all? We have to take care of them, to integrate them. There is always a social dimension, a political dimension, a dimension that allows us to turn the page. If we don't turn the page, instability will prevail.